Do you know about Samsung’s GALAXY Round? Yeah, it’s really a curviest smart phone!!! As the world got stunned, Samsung announced the world’s first curved (deeply) smart phone named Samsung GALAXY round. Samsung has made a revolution in the way smart phones are designed by changing the slight vertical bend in to a horizontal curve. It’s different in design and is going to be first launched in South Korea market and later in the other world markets. 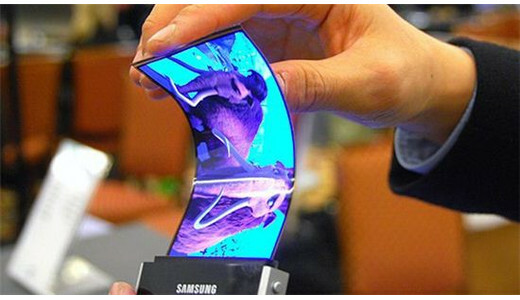 Samsung was continuously striving hard for the design of Curved shape smart phone and has quietly bestowed a name to its flexible AMOLED technology called YOUM. YOUM is the name chosen by the electronic giant for its thin, malleable, flexible screen which is definitely going to be an ideal model for the next generation screens. This type of screen is flexible and can be bent like a curve or arc. YOUM technology attracted many people when it is presented at Consumer Electronic Show which was held in 2011. The 4.5 inch screen was less than 0.3 mm thick and sported an impressive resolution about 800×480 pixels that can be curved. The potential benefit of the round screen isn’t clear yet, but this round interactive screen allows you to look at the information such as missed calls, battery life, Date and time when you tilt it on a flat surface even when the screen is off. Samsung also claims that it has worked on new tilt and tap technologies for better experience with the music and photo apps. Besides the unconventional kind of screen, Samsung Galaxy round has the impressive Spec sheet with a high quality HD display. It is 7.9 mm thick, weighs 154 g and 2800 mAh battery with 13 megapixel camera. The phone runs on Android 4.3 with 3 GB RAM and 2.3 Ghz Quad-core processor. It has clear 5.7” HD Amoled curved display with an extensible internal memory up to 64 GB. Samsung includes two new features with this Samsung GALAXY ROUND Smart phone. One called as “Roll effect” which as already described triggers a glance to the missed call, time and date and battery information even when the phone’s screen is in sleep mode. Another new feature called “Gravity effect” rocks the device with a single finger touch to see a music focused interface that will highlight your tunes. Side buttons will navigate from the previous music tracks to the next one. Since it has Quad-core processor with 2,800 mAh battery it has lengthy running hours when compared to your former smart phones. But, however, battery longevity depends on how frequently you are using the phone. As mentioned before, it has 32 GB of internal storage and can be extended up to 64 GB of internal memory. 3 GB RAM makes your mobile to work very faster and 13 Megapixel camera going to take stunning pictures with high resolution. The smart phone is also featured with Qualcomm snapdragon 800 chipset with CPU of 2.3 GHZ Quad Core krait 400 and a graphics processor of Adreno 330. The specifications are more or less similar to GALAXY NOTE-3 . Connectivity ensures 2G, 3G and 4G(LTE) options with many features. Initially, it has planned to be released in South Korea. When it hits the Indian market, its price can be expected around Rs. 62,000 to Rs.63,000. SAMSUNG GALAXY ROUND blends the latest smart phone screen innovations along with the noticeable unique features. It offers comfortable hand grip to the user, with its exclusive curved display. Along with its unique features as Role effect and gravity effect, it has also added Bounce UX which enables the user to control the music system even when the screen is in sleeping mode. It allows the user to make a short press in the left side of the phone to play the previous track of music system whereas right side plays the next track. For pictures and videos, Side Mirror feature enables the user to gain the list of album by either tilting the phone to left or right side. Also, the device has enhanced multitasking features when compared to the other Samsung releases. Subscribe Here to get all latest updates within your inbox. Sharing is Caring. Do share & make it useful to others. Yes it’s an awesome phone with great design. Glad you like this post. Thanks for coming here. Keep coming. Nice share, Galaxy Curve seems like an amazing phone. It has decent features. Thanks for stopping by. The features available in this curviest smartphone is really awesome. I prefer and recommend this phone to buy. Thanks for dropping your comment here. Keep coming. Thanks for the great review about round Smartphone. This is really unique design and looking gorgeous. People must love this phone. Thanks for your appreciation. It is unique because of it’s curviest feature. Not only for curve thing, it also carries lot of important features to buy this smartphone. People surely love this phone, nowadays samsung smartphones are emerging among the world. Glad you like this post. Keep coming here to drop your comments. You can buy it here man.